Image by 黒沢オティス via FlickrThe awesome people from Androidcentral.com made another great review. 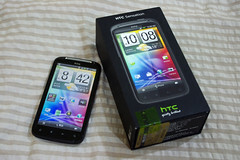 This time it's the HTC Sensation in the European version. The phone comes with great hardware specs, like a 1.2 Ghz Dual-Core Snapdragon. But it uses Sense-UI. We know that's a big piece of software, hated and loved by many people. Will it slow down the amazing hardware? If you want the complete specs and review, please head over to the Androidcentral review.